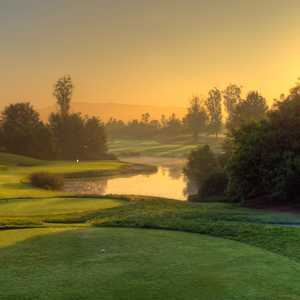 TUSTIN, Calif. -- Officials at Tustin Ranch Golf Club want golfers to "Play Better." They want people to hit better shots, play better courses (a.k.a. theirs) and get better service -- anything to improve a customer's day out of the office. Tustin Ranch Golf Club, a Ted Robinson design, opened in July 1989. This slogan isn't just a catchy course motto, either, but a real pursuit for those involved with the course. Tustin Ranch, a 6,803-yard par-72 layout located in southern California's Orange County, provides many small details that can ultimately add up to a better playing experience for everybody. The course's "Play Better University" has made quite a splash in the golfing community. Every first Saturday of the month, the course offers a free clinic where the teachers from the course's golf school pick a topic of the game -- chipping, putting, driving -- to discuss. With the course's proximity to thousands of area golfers -- it's about 15 minutes from Irvine and Anaheim and about an hour south of downtown Los Angeles -- the seminars usually fill up fast. Then every last Saturday of the month, free club-fitting analysis can help players determine whether the clubs they're using best suits their swing. "If the clubs aren't the right size, you can purchase new ones here or you can go somewhere else," course general manager Mike Litchy said. "There's no pressure. It's all a part to help you play better." Another unique feature can make any round more enjoyable -- hiring a caddie. Tustin Ranch is one of the few public courses in southern California that offers a caddie service, giving amateurs the opportunity to feel like a member of a country club for a day. Caddies read the greens and decipher how far it is to carry a hazard, two tips that usually help people score better. Lessons from the Tustin Ranch Golf School might also help you "Play Better." Certified PGA Professionals cater to individual lessons or group lessons up to eight people. Or chose from one-day, three-day or weekly classes. Junior clinics and on-course instructions are also available. The lighted driving range is open year-round, including up to 12 hours a day during summer. Besides these amenities, there's nothing like a wonderfully manicured course to inspire your game. Tustin Ranch prides itself as the best-conditioned public golf course in Orange County. That's saying something considering other highly regarded facilities like Newport Beach's Pelican Hill and Irvine's Oak Creek and Strawberry Farms are all nearby. The Ted-Robinson design opened in July 1989 and continues to be one of the most popular courses in the area. It rambles through 165 acres of relatively flat land, but the layout is in no way boring. Four majestic lakes come into play on eight holes, creating some pressure-packed, yet fun shots. Tustin Ranch markets itself as "comparable to the best desert courses" and yet it is wall-to-wall lush green grass. 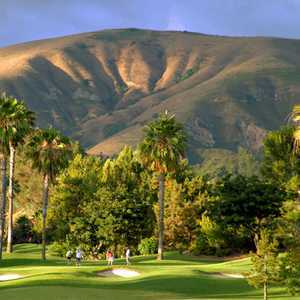 The rolling fairways are lined with mounding and palm trees to keep golfers from feeling like they are on top of each other. Staying in the short grass is vital here, with the thick, club-grabbing rough. The mounding can create many awkward lies, too. Seventy-nine bunkers dot many of the most logical landing areas alongside the fairways and greens. The course's outstanding feature is probably its landscaping. From the grand palm tree-lined entrance to the cascading waterfalls on either side of the No. 11 green, the course's signature hole, Tustin Ranch feels like an upscale resort course, but yet it's right in the middle of a suburban neighborhood. Colorful gardens of flowers have been planted throughout the property. The second hole, a 492-yard par-5, shows off the course's beauty and toughness. The landing area between a bunker on the left and a palm tree cluster to the right is fairly tight. Don't be bold enough to try for an eagle putt on this green, which is tucked behind one of Tustin's smaller lakes. The short, 318-yard fifth hole has seven bunkers to make bogey a reality. The 519-yard, par-5 ninth plays similar to No. 2 with an approach shot that must carry water. The signature 11th hole is a 160-yard par-3 with water on all four sides, including the two waterfalls. Bring the camera and your 'A' game to this tee. The 18th hole, a tough little 362-yard par-4, closes the round with some teeth. The three-tiered green is protected short and left by the same lake from No. 9. "When you look at our condition, there's something about the way we play that keeps people coming back," Litchy said. "Plus, with our guest service, we go that extra mile to make this feel like a private club." Tustin Ranch isn't all about golf, either. The club's restaurant stays open from 7 a.m. until 4 p.m., serving breakfast, lunch and appetizers. Sunday brunch runs every week from 10 a.m.-1:30 p.m. The clubhouse also hosts banquets, reunions and weddings.